Myself and Echo are jetting off (by bus and train) “dahn saaaaath” tomorrow to spend Christmas with my immediate family. Nethertheless, I’ve a last update before Christmas occurs which rather nicely finishes out all the classic Radio Redux shows from time past; yes I’ve added the last three to the RSS stream so they are available to download yet again. A monsterous 3 hours of mayhem as AAUK and his special guest Digicowboy discuss the latest gaming news topics ranging from E3, Sonic 2006, Wii, playing poker with Jimi Hendrix, why the new Robotnik creeps everyone out and Halo 2 endings for Ocarina Of Time. The first non-streamed-full-length episode of Radio Redux. With AAUK’s health mostly better it’s time to get rowdy with some cool Sonic music from past and present. Also includes a special guest interview, Chaotix X episode 2, and more cool game music. Radio Redux #101 – The Beast Is Unleashed! 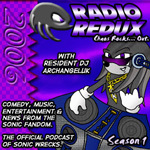 The inaugural Radio Redux broadcast, including the debut of Chaotix X and which – despite the DJ being a nervous mess – provides you with a host of sweet, sweet music and sweet, sweet candy. Bam.